Extremely well built pedal? sturdy and looks awesome. This pedal just oozes with tone! Great for use as either a preamp or as a ?distortion? pedal. There are many sounds and settings to choose from more vintage to more aggressive and modern sounds. When using close to dying 9 volt batteries the result is also quite nice, producing some more textured tones. Two footswitches also means you can set it for use with two different settings such as two volume or gain settings? great for lead and rhythm settings for example. 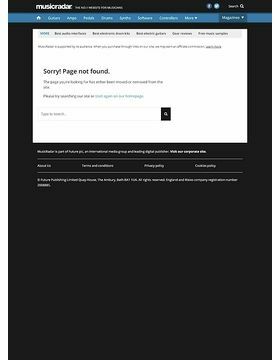 It?s also very useful that toggling between these two settings can be accessed via an external footswitch as well (although this is of course not included)! Also beware that this pedal has literally tons of high gain on tap! It is great for use with solid state amps where the pedal will give you even more from your solid state in terms of tube like feel? however? when used with a real tube amp this pedal is literally massive and sounds very very very very good! Way better than I had imagined and could easily sound better than your tube amp?s distortion sounds, especially for certain applications. It can be powered via 9 volt battery or via a standard 9 volt external power supply. It has an internal compartment for the battery which is accessible using a screw driver? the only small downside if you intend to use it with a battery is that it does consumer batteries more quickly than traditional distortion pedals? therefore I recommend an external power supply. Also to note is that when not in use you should unplug any cables if you have a battery installed since otherwise it will consume the battery even if the pedal is switched off! 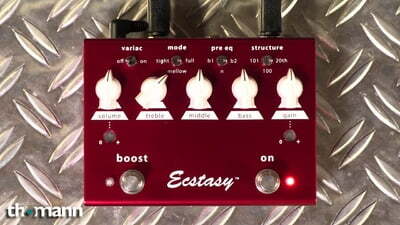 Overall I very highly recommend this pedal for a special Bogner sound. In my opinion quite impossible to be disappointed with this pedal! 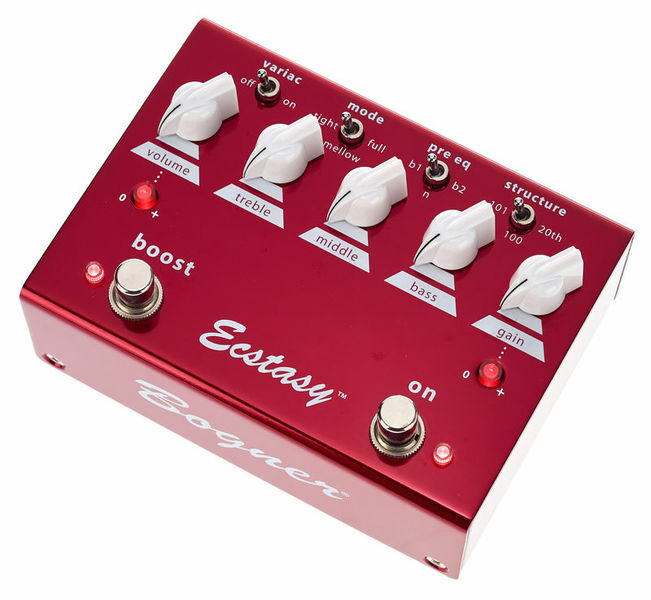 Bogner Red - Ecstasy in a Box! Behind the chicken knobs and hot-rod custom paint job lies a stomp-box of sheer tonal nirvana! Best used into a clean amp channel - the Red pedal summons forth some of Bogners most famous tones in one box. Each of the mini switches really help sculpt 'your' tone from crunch blues, Acca Dacca riffs through to Van Halen and Alice in Chains style riffing. The depth of warmth and complexity of tone here is literally unmatched in any other pedal I have tried. This pedal really, really captures and 'amp in a box' and does it with style, great design and a tone to just wail away on. It might not be cheap, but plugged into the right clean amp, this box beats many other boutique pedals on the market.